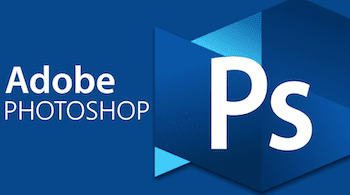 Adobe Photoshop is expensive and not easy to use unless you are a professional. However, we all need to do a little photo editing or resize images and crop for simple reasons such as posting on social media or to add text. Posting a photo online with ugly red eye is certainly not what you would like to do. Do you want to add photo frames or convert to black and white? Instagram is a prime example of how adding a few simple photo effects or graphic design can attract a little more attention. If you are blogging, you always need an image editor to create your unique featured header images. But if you are busy, you want something that is quick and easy. For authors, cover design projects can involve a lot of mockups and colour experiments before deciding on the final design. Basic image editing tools with a simple user interface can come in handy for this stage, but then later, leave the advanced editing to your cover designer. Depending on what you want to do with an image or photo editor, you have a very good choice of free tools. For photo editing, you don’t need to download and install photo editing software. There are a lot of free photo editors online. You can add filters and effects or use a collage maker. All you usually need to do to edit photos is to upload your image file and then download it after you make your changes or add your special effects. But if you want to do more complex tasks and use advanced editing tools, like making a transparent background or using a tilt-shift tool, then there is a choice of open source and free editing tools you can download and install for Mac and PC. 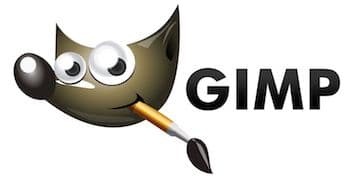 Gimp is the number one choice as an alternative to Photoshop. If you don’t know, the name is an acronym, GNU Image Manipulation Program. It is not easy to learn, so you will need to spend some time getting to grips with how all the tools work. But if you have some experience, they will be familiar. It is available for MacOS, Microsoft Windows and Linux. You can download it here. 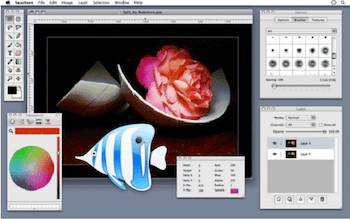 Seashore is an open source image editor. However, it is only available for Mac users. It is much easier to use than Gimp, so it is ideal for people new to image editing. I have used it for a long time because my skills are basic. But it can do everything I need to do with an image editor. If you are an Apple user, it is the best choice. InPixio has a lot of products. But the photo editor is free. It will probably suit people who want to edit photos for sharing online on social media. There is a comparison chart, so you can make a judgement about what it can do. Paint.NET, as the name suggests, is a Windows program. I can’t give a view on it as I am a Mac user. However, Tech Radar gives it a good 4-star review, so it might be a good alternative to Gimp. The download site is here. But it is full of ads, so as a hint, the download link in the top right-hand corner. 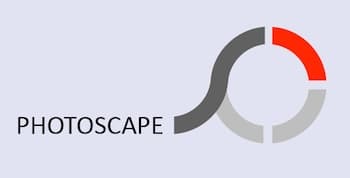 Photoscape is an image and photo editor but is only available for PC users. The editor tools include: resizing, brightness and colour adjustment, white balance, backlight correction, frames, balloons, mosaic mode, adding text, drawing pictures, cropping, filters, red eye removal, blooming, paint brush, clone stamp, and an effect brush. Adobe Photoshop Express is only available as an app for mobile devices. It gets in at number six, well, because it is Adobe so it must be good. The list of features is very long, so I won’t repeat it all here. But I did notice that you can add watermarks to photos. That is a cool feature to individualise your photos. You can get the app on the Apple App Store, Google Play and the Windows Store. Here’s the outline of what Pixlr can do. It has 2 million+ combinations of free effects, filters and overlays. It is a complete mobile photo editing tool that works best for simple tweaks right up to the more creative edits. You can go directly to the editor here. Sumopaint has a feature list as long as your arm. You will need Flash installed on your browser, or you can download the app. It has shape tools, layer effects, linear blur, mosaics and dozens of brushes. There are so many features and tools, it is probably quicker for you to take a look for yourself. Photovisi is a collage maker. So if that is what you want to do, it is a great free option. You can also create social media covers and headers for Facebook, Twitter, Linked, Google Plus and many more. If you are into social media images, this tool could be what you are looking for. Fotor is an image design suite similar to Canva. There are a whole bundle of templates and design tools to choose from. This is going to be a go-to free app for many. PiZap is a simple online editor for photos and images. You will need Flash enabled to use the tools, however. One bonus for this tool is that you can make your own emojis. Well, if that is of interest, take a look. Fotoflexer is a simple upload and edit tool. But you can add effects, fonts, shapes and layers. If you just want a quick and easy to use free picture editor without going to too much effort, you might give it a try. Ribbet has one very cool looking website. As soon as you open its site, you know it knows about image editing. It requires Flash, but it is full of features. You can use it online, or there are apps for iPhone and iPad. BeFunky is a bit if everything. It has an image or photo editor, a collage maker, and a designer similar to Canva and Fotor. 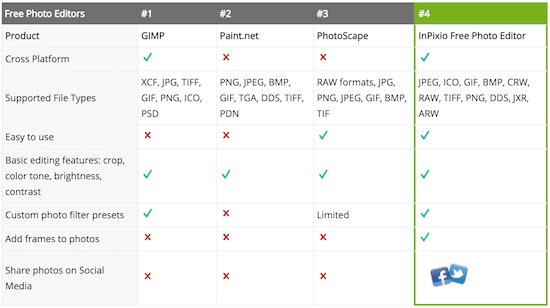 Looks like a good free all-rounder online tool for all your image editing needs. This list would not be complete without mentioning three free image tools that make my life easier. I have used each of these for ages and I use them so often, they live in my dock for easy access. Canva has been my tool of choice for so long that I can’t recall when I started using it. I create all the featured images for my blogs with Canva. It keeps a library of all my uploaded images and designs, so it really helps when I need to add a logo or update a blog image. ImageOptim is a Mac only program. But if you are a Mac user, this is an indispensable little free program. I have it sitting in my dock, and use it so many times a day to losslessly reduce the size of images that I use on my sites. All you need to do is open it, and then drag your images files to it and it reduces the size of your jpeg, png and gif images to your settings. I have it set at 70% reduction and it works absolutely perfectly without any noticeable loss of image quality. Okay, Pixabay is not an app or an image editor. But we all need free images from time to time, and Pixabay is by far my favourite because of the huge selection and image quality. I sometimes use Morguefile, but the free images there are not up to the same standard. I use many premium or paid apps and tools, but there are a lot of free tools I use that do a great job too. Free doesn’t necessarily mean poor quality or performance. But don’t expect priority support for a free tool. You should expect that they might be either advertising supported, or that you will receive a few emails from time to time. Some free tools are slimmed down versions of a premium app or tool or are limited to a trial period, so you need to check. In the end, it is a matter of choice and what works best for you. More reading: Are You Looking For A Totally Free Book Cover Creator? Oh yes, Pixabay is an amazing free images source. OK, GIMP, Canva and Fotor are nice photo editors, but isn’t it great to have a powerful and easy tech supported program? I mostly use PhotoWorks, it well meets all my photo editing needs.